Elegant Baby Shower Invitation ideas and etiquette. If you’re planning an elegant or posh baby shower, the invitation you send is almost as important as the menu you serve. We’ll show easy ways to come up with an impressive and elegant invitation that’s absolutely perfect for the event. 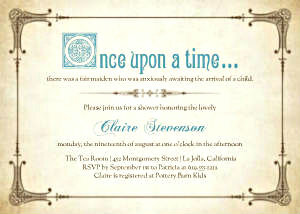 Minted Invitations are known for beautiful and unique designs by the best indie artists in the business. Minted will only use, Luxe paper and the finest inks when they print your cards. Mixbook.com makes custom designing really easy. Of course, the Mixbook site is packed with gorgeous invitations and baby announcements. We really love this site. year, unless the day of the event falls on New Year’s day. there is no “and”: two thousand twenty-three. The phrases “in the afternoon” and “in the evening” are not necessary, but may be used. Provide the city and state of the Baby Shower location. The state and zip code may be omitted if all the guests are local. Avoid using quotes poems and verses on an elegant baby shower invitation. These should be saved for the informal invitation. is true for any maps and directions. We request the honor of your presence. at one o’clock in the afternoon. The rules of etiquette will govern over how people should act or behave. Etiquette governs over social practices as well. The rules of etiquette will also be influenced by culture. 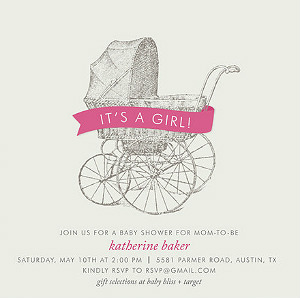 Etiquette also governs the timing in which to order and send a formal baby shower invitation. Invitations should be ordered eight weeks in advance, and postmarked six weeks in advance. An elegant, or formal event often consists of contracting with outside vendors for rentals, catering, supplies, etc. It’s important to allow yourself enough time for preparations and meeting the deadline of any vendors you are contracted with. RSVP requests may require a different response time as well.